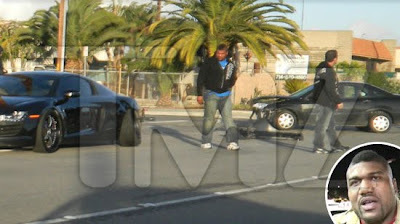 Quinton 'Rampage' Jackson's Audi R8 hit by "little old lady"
Looks like Quinton 'Rampage' Jackson was on the receiving end of a fender-bender this time. According to TMZ, Jackson was driving his black Audi R8 home from an Orange County Audi dealer on Tuesday, when he was rear-ended by an elderly woman. 'Rampage' told TMZ that he tried to make sure the elderly woman that hit him was okay, though she did not speak English very well. Commenting on his own condition Jackson said "I am fine, the little old lady is fine, but my car got hurt, and for that I'm sad." You may recall that just last summer, the A-Team star and MMA fighter caused a rampage through the streets of Orange County after fleeing the scene of an accident. Driving on sidewalks and leading a police chase in a pickup truck with a life-size picture of himself on the side. Unlike his last incident, Jackson told TMZ that police cleared him of any wrongdoing in this latest accident.